The number of pyramids in Nubia (aka Kush) were a total of 223, double the pyramids of its neighbor Egypt. The underground graves of the Nubian pyramids were richly decorated. All pyramids were not monuments of kings is evinced by their great number. Other grandees of the empire, especially priests of high rank, or such as had obtained the sacerdotal dignity, might have found in them their final resting place. The well-known British writer Basil Davidson described Meroë asin the world . Pyramids from the Northern Cemetery at Meroe, 3rd c. B.C. to 4th c. A.D. By the 4th c. B.C., the Kushite kings had moved south to the Sudanese savannah and built a capitol at Meroe. Here southern cultural traditions slowly prevailed over the cultural heritage of Egypt. Nubia was a reservoir of royal pyramids long after they had ceased to be built in Egypt itself. Above the3rd cataract the principle pyramid cemeteries at el-Kurru, Gebel Barkal, Nuri and Meroe, were built about 180 pyramids. The Nubian sequence begins more than 800 years after the last royal pyramid was built in Egypt . The first Nubian pyramids were built at the site of el-Kurru, 13km downstream from the Temple of Amun at Jebel Barkal. The site at el-Kurru contains the tombs of Kashta and his son Piye (Piankhi), five earlier generations, together with Piye's successors Shabako, Shabatko and Tanutamun, and fourteen pyramids of the queens. Taharqa (c.690-664 BC) built his pyramid on the new site at Nuri, but his successor Tanutamun (c.664-656 BC) returned to the site of el-Kurru. The pyramids at Nuri. The Pyramids at Nuri. Located west of the Nile in Upper Nubia.This cemetery contained 21 kings, together with 52 queens and princes. Taharqa, the penultimate king of the 25th Dynasty was the first king to build his tomb at Nuri, and it is the biggest pyramid ever built at the site . Queen Amanishakheto was buried in Nuri also. The first to build his tomb at Nuri was king Taharqa. 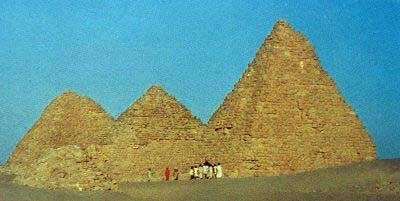 His pyramid had 51.75 m square and 40 or 50 m high. Taharqa subterranean chambers are the most elaborate of any Kushite tomb. The entrance was by an eastern stairway trench , north of the pyramid's central axis, reflecting the alignment of the original smaller pyramid. Three steps led to a doorway, with a moulded frame, that opened to a tunnel, widened and heightened into an antechamber with a barrel-vaulted ceiling. Six massive pillars carved from the natural rock divide the burial chamber into two side aisles and a central nave, each with a barrel-vaulted ceiling. The entire chamber was surrounded by a moat-likecorridor entered steps leading down from in front of the antechamber doorway.After Taharqa 21 kings and 53 queens and princesess were buried at Nuri under pyramids of good masonry, using blocks of local red sandstone. The Nuri pyramids were generally much larger than those at el-Kurru, reaching heights of 20 to 30 m. The last king to be buried at Nuri died in about 308 BC. Pyramids at Nuri, on the opposite bank of the river from Jebel Barkal. Nuri pyramids were much larger than the earlier pyramids at el-Kurra, reaching heights of 20-30m, and were built using blocks of local red sandstone. The last king to be buried at Nuri died around 308 BC. The site of Meroe became the preferred new cemetery. With the exception of three or four generations of pyramids near Jebel Barkal, Meroe remained the Royal Cemetery for around 600 years. Pyramids were built from stepped courses of masonry blocks of local red sandstone, and have survived the test of time rather well. All the tombs at Meroë have been plundered, most infamously by Italian explorer Giuseppe Ferlini (1800-1870) who smashed the tops off 40 pyramids in a quest for treasure in the 1820s. Ferlini found only one cache of gold. His finds were later sold, and remain at the museums in Munich and Berlin. His aim was not to study the pyramids . After 308 BC rose to prominence, and kings began to build pyramids on cemetery of Meroe, between the 5th and 6th cataracts. Meroe remained the royal cemetery for 600 years, until AD 350. The step-sided pyramids of Meroe were built of sandstone, 10 to 30 m high. As at Nuri, the pyramids were stepped and built on a plinth, but now each triangular face was framed by smooth bands of raised masonry along the wedges where the faces met. The Pyramids of el-Kurru. The first Nubian pyramids were built at the site of el-Kurru. The site at el-Kurru contains the tombs of King Kashta and his son Piye (Piankhi), five earlier generations, together with Piye's successors Shabaka, Shabataka and Tanwetamani and 14 pyramids of the queens El-Kurru lies on the right bank of the Nile, about 13 km south from the Gebel Barkal. Eexcavations directed by G.Reisner in 1918-19 discovered on the cementery pyramids, which stood above tombs of kings of XXV Dynasty: Piankhi, Shabaka, Shabataka and Tanutamon. Pyramid of Piankhi had a base length of about 8 m and a slope of probably about 68o. A stairway of 19 steps opened to the east and led to the burial chamber cut into the bedrock as an open trench and covered with a corbelled masonry roof. Piankhi's body had been placed on a bed which rested in the middle of the chamber on a stone bench with its four corners cut away to receive the legs of the bed, so that the bed platform lay directly on the bench. The pyramids of Piankhi scuccessors were similiar. There were also 14 queens pyramids at el-Kurru, 6 to 7 m square, compared to the 8 to 11 m of the king's pyramids. A reconstructed New Kingdom private tomb at Deir el-Medina, Thebes. It is commonly assumed that the Nubian pyramids were inspired by the great pyramids in Egypt, but in fact these smaller taller pyramids bear a closer resemblance to the non-royal "private" tombs of the New Kingdom. These private tombs became popular towards the end of the 18th Dynasty, when the pyramid was no longer the exclusive perogative of the king. The re-emergence of the pyramid after such a significant interval is an interesting case of the transfer of an architectural idea from one region and culture to another. The Nubian pyramids are much smaller, far more numerous and considerably more standardised than those of Egypt's classic pyramid age. Their angle of inclination is severely sharper than that of the true pyramid at 52o51'. In fact the Nubian pyramids distinctly resemble the private "mini" pyramid tombs of the New Kingdom at Deir el-Medina and Abydos. Archaeological excavation of sites in Nubia (Sudan) confirmed human habitation in the river valley during the Paleolithic period that spanned more than 60,000 years of Sudanese history. Most of Sudan remains unexcavated, and archaeologists have little idea of its layout of ancient times. To date we know of three successive kingdoms of Nubia (aka Kush), each with its own capital: the Kingdom of Kerma (2400-1500 BC), that of Napata (1000-300 BC) and finally that of Meroë (300 BC-300 AD). This is not including the elusive A-Group (3800-2800 BC) which little is known, but there is ongoing excavations. What is known as the A-group cemeteries found in Nubia represent its Neolithic culture, and extended along the whole length of Lower Nubia and even beyond the Second Cataract about 200 kilometres south of Aswan. Archaeologists found thousands of graves containing a wide variety of pottery, leather garments, ostrich-feather fans, copper weapons and palettes of quartz, all of which indicated the level of civilization reached by the Nubians. The largest site of Nubian civilization burial pyramids lies north of Khartoum, along the Nile River in ancient Meroë. These pyramids were built by the Kushite people of ancient Sudan to house the bodies of departed kings. They were located in Meroë, the last significant Kushite state.